Pamper Pop, this Father’s Day! Don’t tell me, you’re planning on getting dad another lame tie again this year, or worse…a car-wash booklet?! I’m going to go out on a limb here and guess that his theatrical enthusiasm he’ll use to convince you that he’s over-the-moon with yet another last minute gift idea will leave you feeling guilty about not showing him how much you care! Let’s not go down that road again this year. Just because studies show that us women tend to be a bit more on the vain end of the spectrum than men; focus more on our imperfections, obsess over image far more often than our counterparts, etc., doesn’t mean that men are altogether unconcerned with the way they look. Perhaps choosing a gift to help Dad pull his look together physically might be a sure fire way to surprise him with a unique and thoughtful gift choice this year. This recommendation comes straight from my own home and more specifically, from the toiletries cabinet of my own husband. To say that my hubs is obsessed with this product, doesn’t quite feel right. I quite honestly believe that he would bathe in it, if I would allow him to destroy our bathtub in such a way. Of course, the use of coconut oil on your tresses is old news, as everyone knows that it is quite possibly the most amazingly reparative substance that you can apply. However, the man of my house happens to be bald. What he does use this product for, believe it or not, is his beard! After trying out several different beard oil products specifically designed with your facial hair in mind, he found that my Revive Oil, which was being used on my own hair, actually worked better than anything he’d used before, on his own facial hair! Nothing makes his coarse beard hair as soft and pliable as this stuff, so of course, he’s hooked for life! Grab the Dads in your life a bottle of Revive Oil for their own hair and beard and they will be so grateful that you opened their eyes to the greatness that is coconut oil! J Beverly Hill’s Revive Oil formulated with coconut oil, argan oil and grape seed oil, strengthens elasticity, protects against heat styling, nourishes damaged hair and restores shine. $40.00 at G Michael Salon in Noblesville, Indiana. 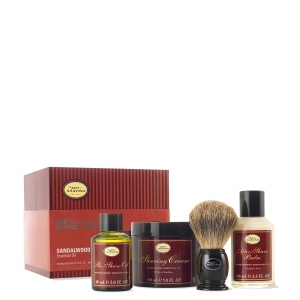 Dad will love this luxurious gift set designed with him in mind. 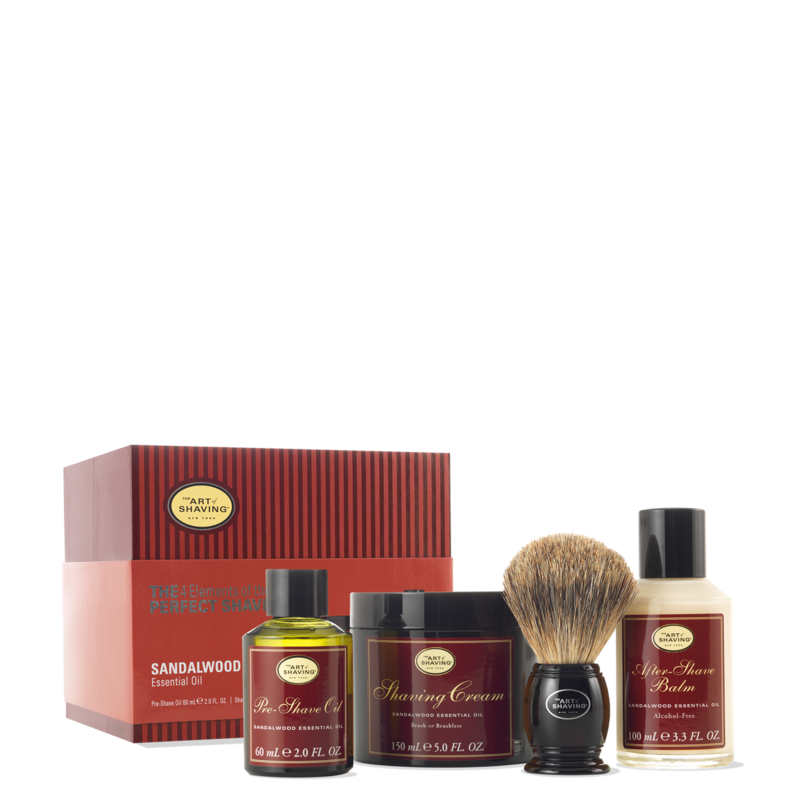 This full size kit includes all four elements of The Perfect Shave®, Pre-Shave Oil, Shaving Cream, a Shaving Brush, and the After-Shave Balm. 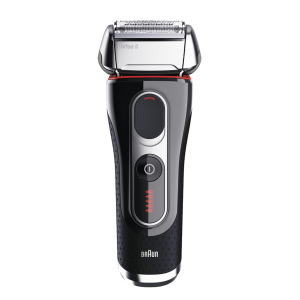 The combination of these quality ingredients, handcrafted accessories, and expert shaving technique provides optimal closeness while helping ward against ingrown hairs, razor burn, and nicks and cuts, while leaving behind a soft and smooth face. The sandalwood essential oils added to these products are absolutely divine, but if Dad isn’t a sandalwood fan, this kit is available for purchase in three other scents; lavender, lemon or ocean kelp and also unscented. $120.00 at The Art of Shaving, located inside the Keystone Mall in Indianapolis, Indiana. Sometimes fragrance is difficult for men to choose for themselves. The options are so overwhelming that a guy can feel grateful when someone chooses a fragrance for him. Dirty by Lush is an amazing, multi-layered scent that is sure to please everyone. This 4-pack gift set includes body spray, perfume, soap and shower gel all designed to leave Dad smelling fresh, sophisticated and oh-so-irresistible. Its refreshing fragrance is made up of spearmint and tarragon to give it a lovely herbal layer that will leave him lightly scented through the whole day. $59.95 at Lush Handmade Cosmetics, located at the Keystone Mall in Indianapolis, Indiana.